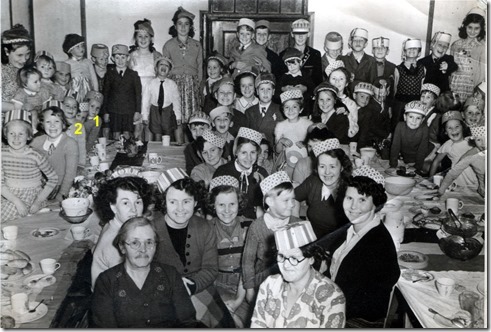 Below is a photo that was taken in the South Green Sunday School hall at the time of the Queen’s Coronation. Do you remember being there? I have marked the photo with a no. 1 which is me and no. 2 which is Suzanne Fage, my younger sister Linda is the little face in-between us so you can only see half of her face. Because we were so young and only living in Billericay for a couple of years neither of us can remember anything else .I think the Sunday school was in Beams way opposite the prefabs .We lived in the second row of prefabs right next to a field. My surname was Drewer. Thanks for adding this Jim, I also have a copy of this photo stored away somewhere. We lived in Beams Way from 1946 to 1958. I am in the photo with my mum (Hilda Sherry), I am just behind the lady in front right who is wearing glasses, my mum is next to me (on my right) in the centre looking straight at the camera. She has a better memory than me and I will ask her if she can identify any others. My family lived in Beams Way from 1946-53 and I went to the Sunday School. I can identify my mother, two brothers and myself. My sister should be there but I cannot see her. I am the lad (aged 12) in the back row wearing a King Edward School blazer; brother Peter (10) is to my right (left in the photo) and I seem to be holding my brother Anthony (4). Wendy – my sister – was 6 but I cannot find her. My mother (Roberta or Bobbie) is immediately behind the left hand front adult.